Home Contests Launch Contest Officially Open! As I said in my inaugural post for the Least Read Blog 2.0, I was planning a little contest to celebrate. I’m feeling like giving away some prizes. That’s right. I spent the past week working on this new website, and to celebrate, I want to give you some cool stuff. 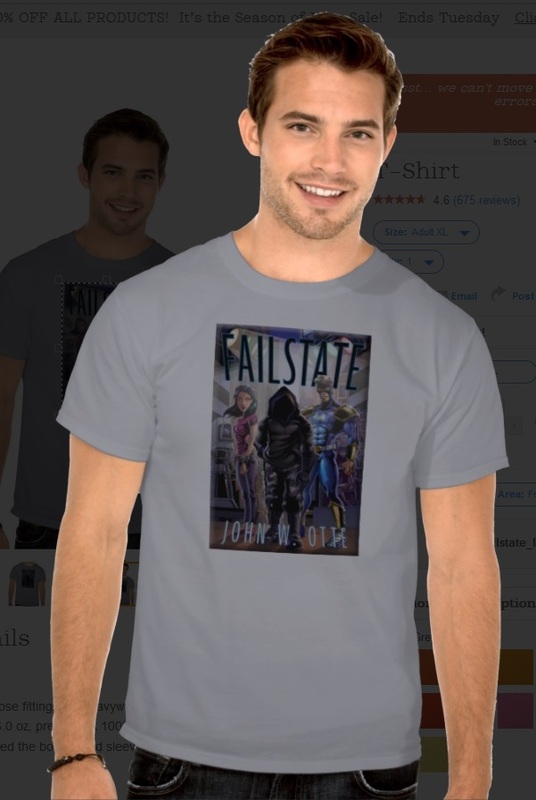 That’s right, I will send you a copy of Failstate, Failstate: Legends, and Numb, each one autographed to whomever you want. I own a similar shirt and I love mine. And I know you’ll be just as handsome and happy if you have one too! A few years ago, I came up with the idea for “Geeky Grace.” Maybe you noticed the explanation of what it means on my main page. I named my e-mail newsletter after Geeky Grace as well. And I thought, hey, why not put it on a t-shirt? NOTE: I haven’t ordered the t-shirts yet, so you don’t have to worry. 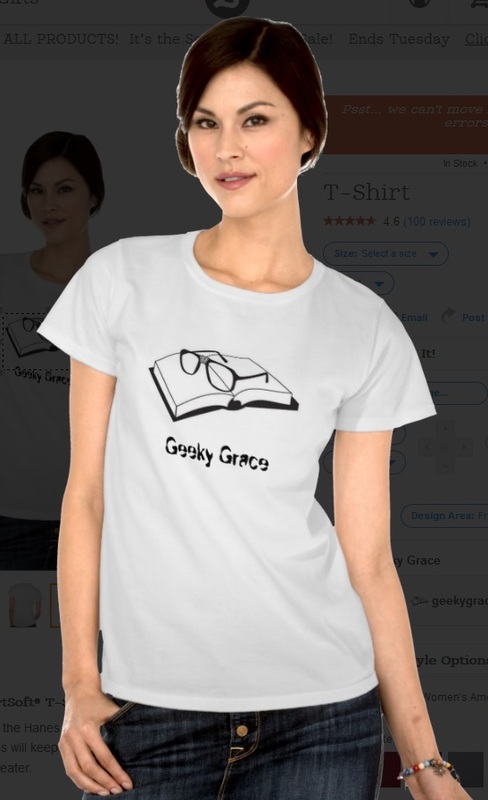 If you’re a guy and you get the Geeky Grace shirt, you can get it in your manly size. The same is true for the ladies and the Failstate t-shirt. What’s your favorite fictional book of all time? Don’t know of i can pick an all-time favorite. But Madman by Tracy Groot would be way up there. One of my favorite fictional books of all time is Tuck Everlasting, after Failstate, of course. I love Island of the Blue Dolphins! Its been one of my favorites since I was young. That is like asking me to pick my favorite kid! (if I had kids) I can not tell you at all, there are too many. Oh, I understand that. My wife actually said that it was unfair of me to ask this question because I can’t really answer it either. LOL! I would have to say my favorite book of all time would be Swimming Through Clouds by Rajdeep Paulus. I don’t normally read contemporary fiction, but this book caught my eye and I couldn’t put it down. That is such a good book! Raj gave me a peek at the sequel and it’s just as wonderful! Ooh, that’s a super hard one! For now I’ll just say The Last Sin Eater by Francine Rivers. Such a hard question to answer! I’d have to say the Lord of the Rings. It was the first novel I ever read and will probably always be my favorite. I could see that. One of the first “adult” novels that I read (quotes because it was targeted for adults as opposed to kids, not because of content) is still one of my favorites, even though I’ve come to realize that the writing isn’t the best. I’d have to say my favorite fictional book of all time is Dragons In Our Midst by Bryan Davis. Favorite fictional book of all time? Augh! Too many books to give a clear-cut favorite, but I’ll say that Cotillion by Georgette Heyer comes in somewhere in the upper thousand. Andy and I are having an argument over whether reading often equals favorite. That said, today I say The Kite Runner. Or Persuasion. Thinking of a classic from childhood….I’d have to say, The Lion, The Witch and the Wardrobe. I love that one too! I keep meaning to read it to my oldest boy, but we keep getting distracted. Favorite book has always been something hard for me to pick. I usually end up with a huge list broken down by genre. But if forced, I always go back to Pride & Prejudice. That’s the book I’ve reread the most. My favorite fictional book of all time is Jane Eyre, but I read a lot and enjoy a lot of different genres, including sci-fi and fantasy. My favorite fictional book of all time…. hmmm… I am going to go with Francine River’s Redeeming Love. Seriously, how can I pick my favorite book of ALL time? What if it hasn’t been written yet? But one book that I just keep coming back to is Peter Pan by JM Barrie. I get more out of it every time. All time fave is Jane Eyre by Charlotte Bronte. Hands down, the Chronicles of Thomas Covenant. The best books ever. I’ll have to agree with Michelle Griep–fiction doesn’t get any better than Jane Eyre by Charlotte Bronte. As an avid reader, I can’t choose just one. I have to say that currently, The Academy Series holds a special place in my heart. It’s hard to select, but my favorite fictional book of all time would be…hmm…well in the top few would be “Negotiator” by Dee Henderson. Hmmmm. How can I choose? From childhood? *The Ghost of Dibble Hollow. * Lately? Anything by Anna Elisabeth Stengl. Her *Starflower* could be used to teach writers about character arc. Compelling! I went on a Anne Elisabeth Stengl binge this last summer. I’ve got Dragonwitch on my Kindle, waiting to be read. That might be next after I get done with the book I’m reading. I’ll have to go with Lord of the Rings. I want to say The Chronicles of Thomas Covenant the Unbeliever (the first trilogy) but the fact that I’ve never re-read them makes me think they influenced me more than became favorites. Well, I haven’t read all the books I’d like to yet, so this is just the best I’ve read or the most influential. It would be the series of the Boxcar Children. When I was a child,. this series is what began my launch into mystery and fiction in a major way. I still love them along with all the fiction for “older” folks. I will say my favorite of all time is The Lord of the Flies by William Golding. Yeah, that’s an interesting read. I had to read it in high school and it’s always kind of stuck with me. I actually started writing a sequel to make sure that the “bad boys” were brought to justice eventually. LOL! Nice site. I’ll go with all Barbara Kingsolver accomplished in The Poisonwood Bible. My favorite fictional book is Way of Kings, by Brandon Sanderson. Such an epic story. I think I have that one waiting for me in my Kindle. I’ve been on a Sanderson kick recently. I love Firebird! That book is part of the reason why I “got serious” enough about my writing to actually pursue publishing. So if anyone’s looking for who to blame that I’m published, it’s Kathy’s fault. LOL! It’s very difficult to chose just one fiction book, so many can not be compared. I have many “favorites.” I’ll settle for Christian spec fic; the one that comes to mind that really made an impact on me was Dekker’s Red. Followed closely behind is the entire Lamb Among the Stars series, which I think is the greatest contribution to our little subgenre (and so little appreciated). Please, everyone, do read those books, and Chris Whaley, please write more. Oh, those are good books! I’ve been meaning to re-read them soon, but I have so many books in my to-be-read pile as it is! Probably the Firebird Trilogy, by Kathy Tyers. I read those books when I was like 13, and they made a huge impact on me. The Hero and the Crown, by Robin McKinley. Honorable mention to My Friend Flicka, by Mary O’Hara. My mother read it to me when I was too small to hold a book that big, and it will always be special to me. Finding it hard to pick just one book so it’s going to have to be a wee tiny list. My favourites are Stephen Lawhead’s Empyrion Saga and Zenna Henderson’s Ingathering. Really liking Anne McCaffrey’s Pern lately, too. My favorite fictional book series is Sir Arthur Conan Doyle’s Sherlock Holmes series. I love the mystery, intrigue, and the truly outstanding characters! For me, The Lord of the Rings trilogy wins hands down. I still love this story after reading it inummerable times and writing a book about it. I think my favorite fictional book of all time is…. (hmm, this is hard) I think it might be “In the After” by Demitria Lunetta. I would have to say the Hobbitt. Favorite book? I wonder why people keep asking this when I can’t pick just one. I really admire Rick Riordan’s humor and well thought out voice. I also like Kat Fall’s Dark Life because of the lovely characters and plot twists. I related so well to the main character. I’m also a big fan of Bryan Davis’s books. I like the books of Bryan Davis too. I’ve read them a lot to my boys. He’s a pretty cool guy in person too. I’ve been to one of his writer’s workshops.